Blindcrake is located off the A595 Cockermouth (4 miles) to Carlisle (23 miles) road in Cumbria. 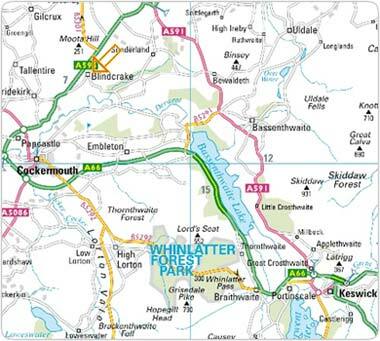 It is 12 miles from Keswick and, along the A66, it is 29 miles from the M6 motorway at Penrith. It lies at the north ern-most boundary of the Lake District National Park. The parish includes Blindcrake village and the hamlets of Redmain, Isel and Sunderland. The parish boundary is approximately defined by the A595 in the west, by the Lake District National Park boundary in the north, by a line 2km to the west of the A591 in the east and by the River Derwent in the south. It is one of the smallest parishes within the Allerdale district of Cumbria. An interactive Googlemap is shown below left. A detailed map showing the Parish Boundaries can be downloaded by following the Council>Publications link in the menu bar above (note: the pdf file is 4.3MB). There is also a downloadable jpeg file of the houses in Blindcrake Village on the same webpage.